Ridge Racer DS offers a whole new racing experience with true analog steering through the DS touch screen and up to six player races. 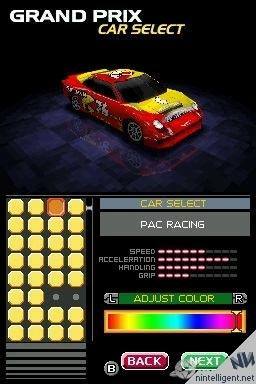 Thanks to the power of the Nintendo DS, full 3-D graphics are possible on a handheld, allowing for total racing immersion in detailed racing environments. The revitalisation of the Ridge Racer series continues apace, thanks mainly to the arrival of two new handheld formats: the PSP and Nintendo DS. Whilst the PSP version has attracted much of the fanfare, its dual-screen brother has been running on empty - which is unfortunate, because Ridge Racer DS is very much a pilgrimage for fans of the series, retaining many familiar tracks and most importantly the arcade flavour. With the added bonus of being playable on the move, along with its novel system of control, this is one DS title that deserves your attention. Pick from 20 total exciting racetracks - A total of 20 racetracks in three different locales including the quintessential Ridge Racer cityscape, a scenic Northwest course from Ridge Racer revolution and the sun-baked desert of the Southwest. Nintendo DS system and a copy of this game. Eager to deliver a quality racer - in the midst of fevered anticipation for Mario Kart - Nintendo handled development duties themselves. The single-player mode is comprised of Grand Prix races and car challenges - with the latter allowing you to take on and win those vehicles if successful. Truth be told, there really isn't anything within the DS framework that hasn't seen before; many have compared this game to the Nintendo 64 version of yore - and it's certainly a fair point of reference. On paper, the Grand Prix mode looks commanding - with 20 tracks and over 30 cars to acquire - however such figures need to be placed in context. The tracks typically provide variations of the arcade concourse, which effectively translate to a handful of locations and environments. 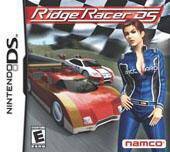 At a time when contemporary racing games seem obsessed with shortcuts and alternate routes, it's refreshing to find that Ridge Racer DS instead focuses on driving performance. Speaking of which, Nintendo have introduced three levels of control difficulty: the easiest employs the tiny D-pad for movement in conjunction with the buttons (i.e., tried and true). The only criticism with this method is that it confirms the D-pad is a touch too small, and its plastic construction a little too clunky. The next option is the stylus, which can be used to control the steering wheel on the lower screen. The cars themselves are categorised in terms of speed, handling, acceleration and so forth - and some motors will ideally appeal to expert players (for instance, those who would favour power sliding over cornering). Mind-boggling at first, it goes against the grain of everything we've learned about racing schematics, but given time it becomes eerily comfortable. The thing to remember is that by removing the stylus (from the screen) the steering wheel will centre automatically. And while the first few races might resemble pinball - as you haphazardly collide with every obstacle on screen - the stylus increasingly offers a refined alternative . 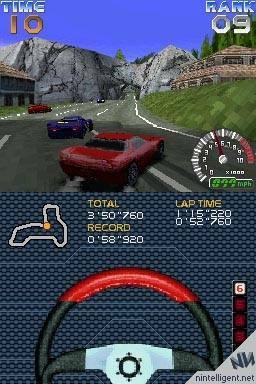 Graphically, Ridge Racer looks rather impressive on the Nintendo DS - with awesome polygon models, great backgrounds and more importantly a stable frame rate. As with the graphics, the musical score and sound effects all return from the wilderness (e.g. the original Ridge Racer) to make a welcomed return to this awesome portable console. In conclusion, Ridge Racer DS is a worthy racing game for the system and offers some great graphics, addictive gameplay and a blast down memory lane. A must have for car fans or for those gamers that want a hard - fast and great game! Check it out!